“Based on a true story” usually indicates that the audience can expect slow pace, breaks in the story, and an unsatisfactory ending. The “Zodiac Effect”, I would call it, but there’s a history of that in mobster films as well. 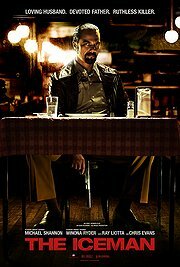 “The Iceman” steps onto those tracks, and experiences similar effects: the story is intriguing, we are witnessing the making of a professional hitman, a fixer of problems that the cartel bosses want fixed permanently. There couldn’t be a better casting for this than Michael Shannon. He is slightly tortured by the idea of killing, but would be more tortured by being unable to care for his family, so stays his agnostic self, killing when killing is needed, apparently never developing a liking for it, doing a job he is better at doing than the rest. As “real events” keep doing, not much happens for a while. The film jumps ahead to when something does happen, and that usually means something goes awry. A witness gets away, and the cartel is not happy, basically grounding their killer kingpin. This forces him into freelancing, and about this the bosses are even less happy. Nooses start closing around necks, the calm life if crime is in turmoil, finally it becomes clear that all this will fall apart, and that people will start dying. The script plays this out as a family drama, with Shannon’s Richard first and foremost seeking to take care of his family. Unfortunately the part of the wife is cast with less talent (Winona Ryder), and is seriously under-written, leaving Ryder to perform hysterical fits and windmilling her hands. May well be that this is also based on reality, but then again, if facts are more boring than fiction, a movie should revert to fiction for its own good, shouldn’t it? There are some nice side-characters, most notably hitman colleague “Mr Freezy” (Chris Evans), who is some variation on the “Dude” type, only equipped with as hacksaw and a strong stomach. Ray Liotta will never play a non-crook in his life, this is also established firmly by his role as gangster boss Roy. I was not bored by the film, I was not thrilled, I was an interested observer of these lives. As a thriller or drama, this may not be what the film intended, but to be thrilling, there was a severe lack of drama and surprise. Michael Shannon saved the day, as he does so often. And I was reminded that “Boardwalk Empire” starts again these days, which shows how serious mobster drama can be done.